October's update brings you two new pages this month. This second page features an interesting example of maritime marquetry where, the panels you see below decorated the upmarket cabins and state rooms of ships in the Blue Funnel line. Janet Nicholson is the owner. 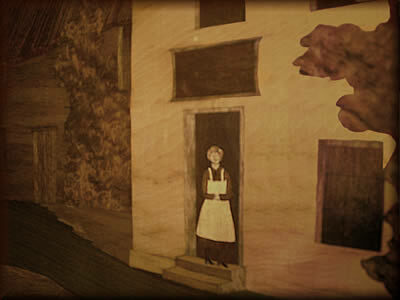 "I wonder if you can help with some information on two marquetry panels that we own. They have been in the family since the 1960s and were originally in the 'saloon' of one of the Blue Funnel liners (I think the Agamemnon). My father was a ships joiner with Blue Funnel and he bought them from the company. They measure 2.1 metres x 1.3 metres and are of country / village cenes. 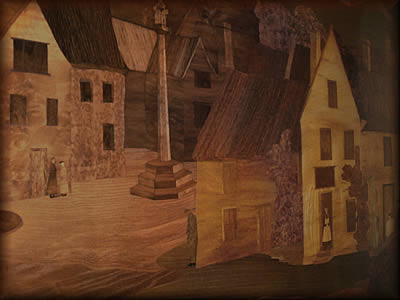 Is it possible to find more information about these marquetry pictures? Plus, is it also possible to give me an idea regarding the value as reluctantly, I fear I may have to sell them?" Trying to identify marquetry artists or makers from their personal marquetry style is very difficult. It is not a medium that has obvious traits such as the brush work with oil paint. Brush work is almost a finger print for the artist - it gives a strong clue to the maker (or artist). 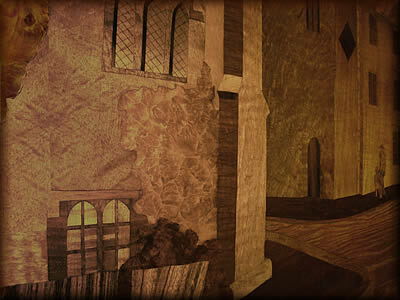 But unfortunately, the same doesn't apply to marquetry. The style of cutting and veneer selection is, at the moment, not very useful as a factor for artist identification. The main problem being that a vast majority of marquetry is still made by woodworkers and cabinet makers - it hasn't yet been fully adopted by the art world. 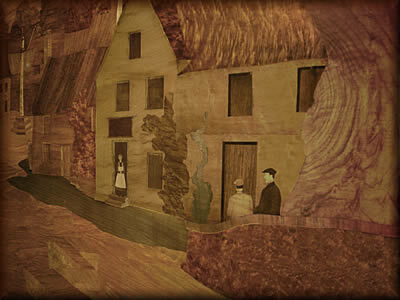 But, times are changing and marquetry as an artistic movement is starting to gain ground. However, that doesn't help with identifying the craftsman who made your marquetry panels. 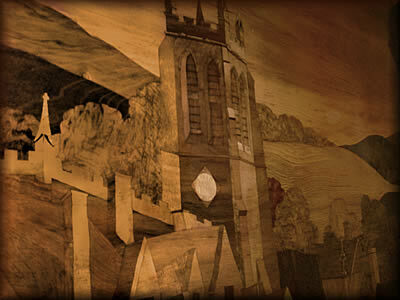 The trouble with most marquetry is that the maker or artist rarely signs their work. That rule certainly does not apply to the established art world where "Picasso" and "Vincent" and suchlike abound! Sadly marquetry pictures are not usually marked with the maker and there is currently no index of marquetry artists as there is in painting. 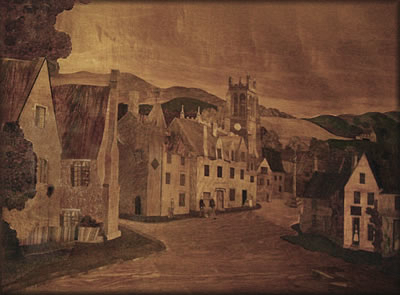 Having said that, your story is very interesting and we are happy to display your marquetry panels here to see if anyone could identify the scenes or even the maker. We have a number of members in the Marquetry Society who were in the Merchant navy and hopefully a couple of them might be able to help. As for value, we are unable to give you any information regarding that side of things as we are not a commercial organisation and have no facilities for offering up to date valuations. Very much like any collection, they are worth as much as someone wishes to pay for them. The history behind them, especially as Blue Funnel went out of business in 1988 would presumably add to their value. According to my research there were 5 ships called Agamemnon with Blue funnel. I looked to see if I could find somewhere that would advise on furnishings on Blue Line but drew a blank. I suggest having a word with your insurance co. or an art valuer at an auction site or even advertise them on Ebay and see what folk would be willing to pay for them." David W. of the Editorial Team. A question we regularly get asked is "how much do you think my B & G picture may be worth?" Well, given the current difficult financial climate, the short answer is "as much as someone is willing to pay!". This is not to say that there is a lower subjective value in the works, it is just that market values are not presenting what we would see as an accurate balance at the present moment. Actually, this could all work rather well in your favor if you are a collector of B & G works, being that it is somewhat of a buyer's market at the moment. If you take the long term viewpoint, this is probably a good opportunity to scour the second hand shops and boot/garage sales and pick up a B & G bargain or two! Don't forget, B & G don't exist anymore, and original clean pieces will eventually become very difficult to obtain. So, don't despair if you see some B & G pieces "going for a song", it doesn't mean they have lost their value, it just means everything is readjusting. Given a more favorable normalization in the monetary system, B & G Wood Inlay Works will see their true values reestablished once again. So, just hold on in there, you'll be more than glad you did. Click the above button to return to page 33 of "Can You Help"